The reconstruction of River Road in Windham, and others, has spurred some questions and conversation about trees in a road right-of-way. Over the years, people tend to plant trees along the road frontage of their properties to give themselves a buffer from the noisy traffic. This is a great idea, as long as you know where the road right-of-way ends and your property begins. If you plant it in the road right-of-way, you could lose your screen someday. The owners of the road, whoever that may be, actually own the trees within its bounds. Our company has done a lot of roadside cutting for various towns, and we’re always vigilant about trying to notify people prior to removing trees along their road front. Most of the towns we work for instruct us to leave the hardwood, as a courtesy, for the adjacent property owners to pick up even though the trees were not technically on their property. So remember, if you ever decide to plant trees along your road front, find out where your property actually begins before planting so you don’t run a risk of eventually losing your trees. Looking up before planting a tree is also a good idea, as some people plant under power and phone lines without even thinking. This can eventually result in a very lop-sided tree, and we all know that a lop-sided tree is not a happy tree. Robert Fogg is general manager of Q-Team Tree Service in Naples and is also a licensed Arborist. My family was staying at a cottage on True’s Point in New Gloucester, Maine in the summer of 1969. It was late on, July 29, when my father woke me along with my three brothers. From my cot, nearby, I could see my mother and father huddled around a small black and white television and I could hear my father saying, “Stay awake, stay awake this is one of the most important times in history and I don’t want you to miss it.” As I watched I could see a slightly out of focus image of a man in space suit climb down some stairs and set foot on the moon. I was one of a half billion people in the world united at that very moment listening to those momentous words, “That's one small step for a man, one giant leap for mankind." At the time, I did not realize how this one footstep, so far away from our tiny lake cottage, could be so important, but it has turned out to be one of the greatest moments in the history of the United States and the world. I can’t help but wonder how many children around the world were watching. And what was the influence of that moment on the rest of their lives? On Tuesday, July 29 and August 12, Family Star Gazing Night will occur after dark on Hacker Hill, off Quaker Ridge Road in Casco. Join Ed Gleason from the University of Maine Planetarium and David Manchester, a member of Southern Maine Astronomers and take a closer look with their guidance of the night sky. Lisa Davison, our youth services assistant at the library will also be there both evenings. A grant from Loon Echo Trust has made both of these evenings possible and is a collaboration between the Raymond Village Library and Casco Village Library. It is free and open to the public. For more information, call the Raymond Village Library at 655-4283 or the Casco Public Library at 627-4541. Stop by the Raymond Village Library Book Sale this summer through August. We have many fiction, non-fiction, large print books, music CDs, vinyl and children’s books at low, low prices and in great condition, many suitable for gift giving. You may even find some interesting sci-fi fiction. Many clients are concerned about “red flags” that can trigger an IRS audit. Since the IRS audits less than one percent of all individual tax returns annually, the odds are pretty low that your return will be chosen for review. I believe that you should take every legitimate deduction that is available to you, so I am not suggesting that you pay more in taxes than you should just to avoid the small risk of a potential audit. That being said, the presence of the following factors in your return increases the chances that the IRS will come calling. Taking a loss on a hobby: The IRS defines a business as an activity entered into that is carried on with reasonable expectation of making a profit. The IRS presumes that an activity is a business if it makes a profit during at least three of the last five years. If an activity is not a business then it is a hobby and you can only deduct expenses up to the revenue generated by the activity. So if you run a business that has not made money in three of the last five years make sure you run the activity in a businesslike manner and can provide supporting documents for all expenses. Large Deductions for business meals, travel and entertainment: History shows that most underreporting of income and overstating of deductions are done by those who are self-employed. As a result, IRS agents are on the lookout for big deductions for meals, travel and entertainment that are personal in nature. To qualify for meal or entertainment deductions, you must keep detailed records that document the amount, the place, the people attending, the business purpose and the nature of the discussion or meeting. Also, you must keep receipts for expenditures over $75 or for any expense for lodging while traveling away from home. Claiming 100 percent business use of a vehicle: When you depreciate a car, you have to list on Form 4562 what percentage of its use during the year was for business. Claiming 100 percent business use of an automobile is red meat for IRS agents. IRS agents are trained to focus on this issue and will scrutinize your records. Make sure you keep detailed mileage logs and precise calendar entries for the purpose of every road trip. Sloppy recordkeeping makes it easy for the revenue agent to disallow your deduction. As a reminder, if you use the IRS' standard mileage rate, you can't also claim actual expenses for maintenance, insurance and other out-of-pocket costs. The IRS has seen such shenanigans and is on the lookout for more. Last Sunday, the American Legion Auxiliary Unit 148 became official with the instillation of its charter members and its officers at the Windham Veteran’s Center. Legion Auxiliary members from all over the state attended and ran the ceremony. Ten charter members were installed and will have their names on a plaque donated by the American Legion Post 148. Pam Whynot was elected president, Michelle Libby was elected vice president, Barbara Voisine is the new treasurer and Aileen Pelletier is the new secretary. The organization supports Veteran’s and the American Legion Post 148 through fundraising. They also will raise money to send girls to Girls’ State once a year so the chosen girls can learn about how governments run. All members have some connection to a branch of the military. To be involved, contact Pam Whynot at pwhynot81719@roadrunner.com. 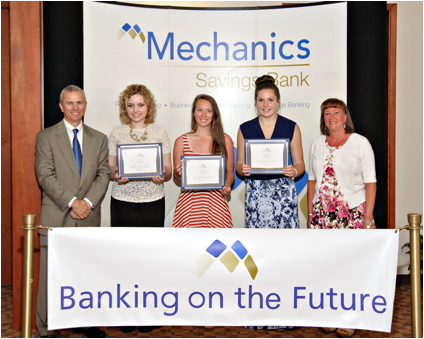 Photo caption: (Left to right) Mechanics Savings Bank President, Rick Vail; Mechanics Savings Bank’s 2014 Banking on the Future scholarship recipients from Windham High School, Kyah Morrissette, Laura McKenna, and Haley Batchelder; and Mechanics Savings Bank Windham Branch Manager, Vickie McMullen. WINDAHM - Three Windham High School graduates will begin their college education this fall with a little help from Mechanics Savings Bank. Kyah Morrissette, Laura McKenna and Haley Batchelder are three of the seventeen local students to earn this year’s $1,000 Banking on the Future scholarship. Kyah Morrissette is the daughter of Francine and Scott Morrissette. At Windham High School, she made an impression among her classmates and teachers as a scholar, with a sense of humor. In the fall, Kyah will be attending Colby College, in Waterville, Maine. Laura McKenna is the daughter of Mary and Daniel McKenna. Faculty at Windham High School have described Laura as a determined, responsible and hard working young woman with a strong work ethic, citing her as a good leader. This fall Laura will be attending Colby-Sawyer College in New London, New Hampshire, where she will study child development and pre-law. Once she receives her Bachelor of Science, she intends to attend law school and pursue a career in child advocacy. Haley Batchelder is the daughter of Stacy and Randy Batchelder. Haley’s coaches recognize her as an individual who has incredibly high standards for herself and whose great attitude and behavior make her an excellent role model. This fall she will begin to follow her career goal of becoming a pharmacist by attending the University of Rhode Island. For more than twenty years, Mechanics Savings Bank has provided scholarships to assist high school seniors bound for college or technical school with their higher education goals. This year, the Banking on the Future Scholarship program awarded $17,000 to students from local high schools, including: Edward Little, Lewiston, Saint Dominic, Leavitt, Lisbon, Oak Hill, Poland, Gray/ New Gloucester, Brunswick, Mt. Ararat and Windham. Mechanics Savings Bank plans to offer Banking on the Future scholarships again in 2015. The scholarship application can be downloaded from the bank’s website: www.mechanicssavings.com or it can be retrieved from the guidance office at participating high schools. The application process begins in January and typically ends early April. Deadlines vary by high school. The REAL School welcomed some special guests to their campus on Mackworth Island last week. Governor LePage, along with his senior policy advisor on education issues, Tom Desjardins, met with students, staff and the AmeriCorps team on Wednesday, July 9th. The purpose of the Governor’s visit was to learn more about the school’s innovative approach to service learning and workplace readiness. REAL School staff has developed a comprehensive guide to project-based service learning to allow students to learn and demonstrate proficiency in academic standards in authentic, hands-on ways. The REAL School’s service learning program will be replicated at both Windham High School and Manchester School next year. REAL School principal Pender Makin said the school has received additional grant funding from the Maine Commission for Community Service to support four full time AmeriCorps National Service Members, two at each school. They will help implement the program with students at risk, with a goal of increasing academic engagement, said Makin. According to Makin, the success of the program during the past two pilot years has prompted the Maine Commission for Community Service to recommend that they seek federal funding as a national model for increasing academic engagement in at risk students. “We are hoping to fund our service learning program and curriculum guide as a national model through the Corporation for National Community Service, based on the success of our pilot programs and our upcoming replication projects,” she said. 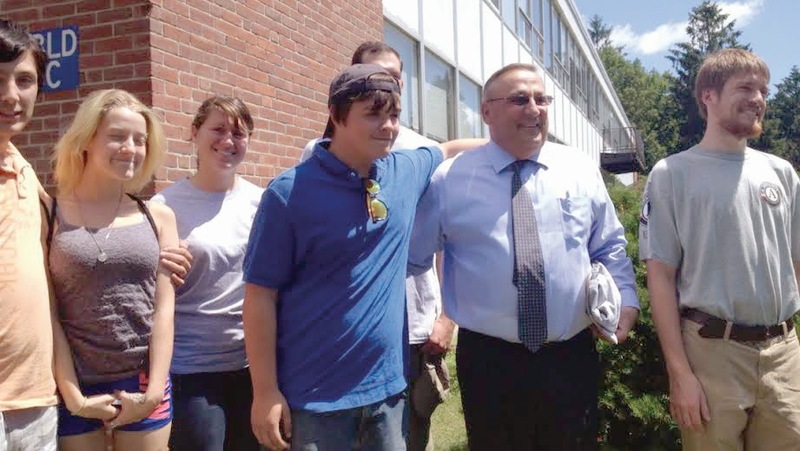 During his visit, Governor LePage swapped stories with students about difficult childhood experiences, socio-economic struggles, homelessness and challenging school experiences. The students and the Governor agreed that strong adult mentors and caring teachers can make all the difference to young people in need, said Makin. “We were grateful to be recognized for the accomplishments of our wonderful students, staff members and AmeriCorps team. The students enjoyed meeting the governor, and commented later that he seemed like a really nice guy,” she added. Wellness seems to be the word of our times. There are people telling us how we can be aware of our own wellness. RSU14 has been recognized for the promotion of wellness. We have won national awards and received the Carol M. White Pep Grant, which kick started our i225 movement. (If you haven’t heard of i225 check out www.i225.org). All the schools have updated from the My Pyramid to the newest (easier to understand) Choose My Plate. I encourage everyone to check out (www.choosemyplate.gov). With all the new information coming at us today it can be hard to navigate this world of wellness. Not to worry RSU14 has a wellness team that is full of energy and filled with new ideas and teachings. RSU14 has had a wellness team for many years supporting many programs and scholarships. They have supported staff in programs such as March into May and Go Red for Women Day. They have offered cooking programs for students and have brought Zumba to schools for an afternoon wellness activity. Recently eight members of the wellness team attended The Maine Wellness Conference for Educators. We spent three days and two nights learning about technology, apps, food, dance, and how to promote wellness not only in the schools to staff and students but to reach out to the parents and community. We were the largest group representing schools from all over the state of Maine. Not only did we attend the conference but in a few of our round table discussions and learning centers we were able to share what we are doing as a district and community. We brought to the table the growth Windham’s Community Garden, the work and education of the i225 and the 5210 programs. We were able to educate others on our work with the Hannaford and our work with the Guiding Stars. We also worked on our team’s action plan and how to implement it. We had fun, but did work hard at learning how to work as a team and get ourselves out in the community. We hope that you have seen or heard of the great things RSU14 is bringing to staff, students and the community. We are a hardworking and dedicated team who want to bring new ideas, fun activities and wellness education and awareness to the whole community. We are excited for school to start (but hope that summer doesn’t go by too fast) and our team to meet again and get to work.